Did you know Kate Moss had a younger sister? 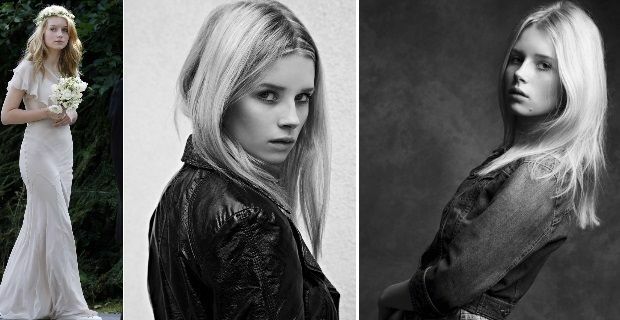 Well, half the world knows now, since Lottie Moss, quickly dubbed 'Little Moss' by the media, just got signed by prominent model agency Storm, and it looks like the beginning of a promising career. Kate and Lottie are half sisters and, unsurprisingly, they share many a feature. Both slender, blonde and beautiful, somehow petite for the fashion world, extremely photogenic and with a cool Britannia touch. Kate managed to become the top of the top models with an hight of 5'8, which is considered smaller than your average catwalk model. Lottie is only 5'5, rather small for fashion industry standard, but we are sure this will not get in the way of her success as a model. After all, she has some footstep to follow! Surely it must be challenging to try and emerge from the huge shadow of her big sister, but being Little Moss also means that you have all eyes on you and all the right doors magically open. And, judging by results of her first professional photoshoots, it's all well deserved: Lottie has not only the looks, but also the right attitude in front of the camera. Very professional indeed. American modelling agency Storm must be pretty chuffed at having caught the second Moss in a row: it was their talent scout who first spotted scrappy 14-year-old Kate at JFK airport many moons ago, and it was them who turned her into the iconic supermodel we all know. Unsurprisingly, they had also noticed Lottie at her big sister's big day in 2011, when she was one of the 15 bridesmades and stood out for her striking looks at only 13-year-old. However, at the time Lottie's mother gently declined their offer, explaining that her daughter was still too young to model professionally but didn't rule out the possibility that, once a little older, Lottie may decide to give it a go. Apparently that time has come: it is quite significant that Lottie had her first photoshoot taken on her sweet 16th birthday. Good luck Lottie, and let's hope that the industry will respect the fact that you are a person on your own, not just a mini-version of fashion goddess Kate.